Let me start of by stating that this was just a Virtualization User Group - Boston meeting, not an official Intel PR-approved presentation. 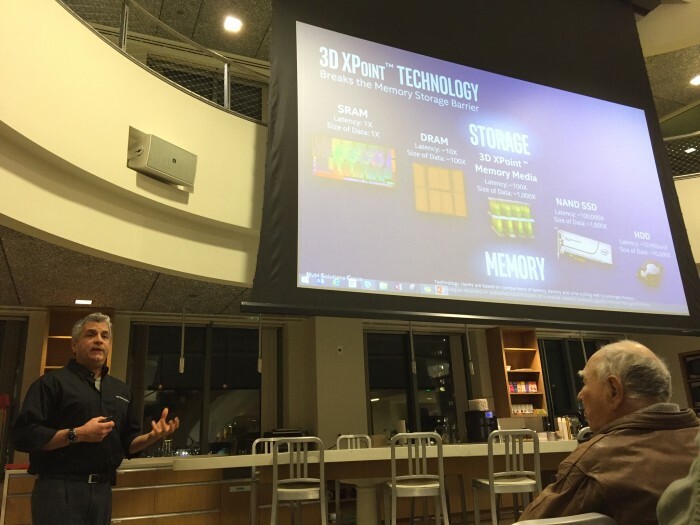 I'm simply sharing what I learned at this event, with 2016 shaping up to be an exciting year in storage tech. So glad I made the 100 mile drive up, to meet some new folks, and to learn more about the latest storage tech, so I can share it all with you! Special thanks for the leaders of the Virtualization Group – Boston, for making this free event happen. Always good to learn what's going on out there, see also SolidFire Named All-Flash Systems Product of the Year by Storage Magazine/SearchStorage.com, and Jeramiah's unique and fun sense of humor from a recent Boston VMUG here. We learned that in our audience of about 50 people, only 3 hands went up when Greg asked how many were using NVMe storage today. You guessed it, mine was one of them. See also Google search results for NVMe mentions at TinkerTry. Silent data corruption detection technology is getting more advanced, using radiation tests to get systems to hang or fail. As far as data corruption avoidance, Intel claims to be the best among their competitors. 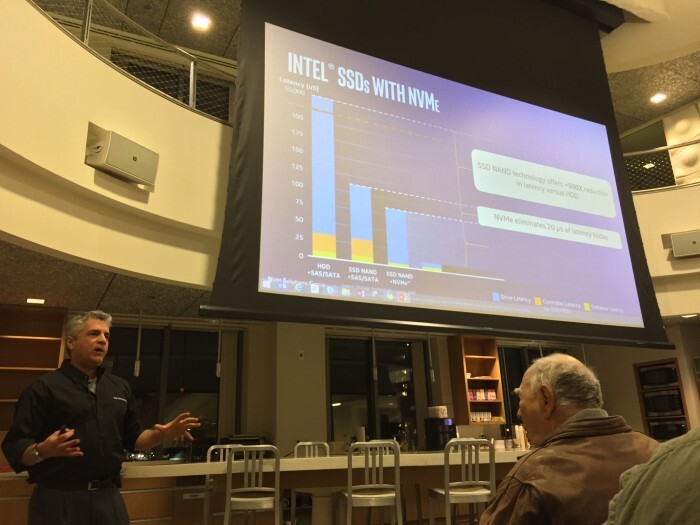 Intel Optane is simply their term for NVMe "hot tier" storage. yes, so we have them on our roadmap, and um, we will be, we will be introducing them, I think they're coming out this year actually...I'm a generalist, so part of our business is with folks that do high-end gaming PCs and stuff, they absolutely need that, people doing workstations and CAD, so we want to be in that business, and we think we're in a good position, because when we get those out, we'll do NVMe in, in that you know M.2 form-factor, and then we can follow-up with the XPoint solutions to go even faster. I believe the Virtualization User Group - Boston plans to publicly publish the full audio and video of the recorded event on Vimeo here. I'm really framing this question from a consumer/home server enthusiast perspective, where price and performance trump endurance. What do you think, will you be interested in Intel's response to the Samsung 950 PRO, or are they too late? Drop a comment below! FYI, when I was benchmarking the Samsung 950 PRO, I used full chassis fan speeds to easily avoid any throttling. Stay tuned for a simple and better solution that I've come up with, confirmed by FLIR One thermal imaging analysis. I'll be demonstrating this on the world's first Xeon D-1541 sample, at my local VMUG this Tuesday, March 1st. I personally think the heat dissipation issues have been a bit overblown for home lab or gamer use. Even when this self-preservation throttling kicks in, the speeds are still far faster than any SATA3 SSD. Most of the time you're doing momentary reads that only briefly spike anywhere near the 7 watt peak, spending most of the time idling along at a mere 70mW.